Before I went home to visit, my brother, Josh, posted on my facebook a picture of something that was (more or less) s'mores brownies-with the caption "Make these for me!" Well, as luck would have it...I'd been yearning to make How Sweet's recipe for S'mores Brownies for quite some time. Michael's not a ginormous s'mores fan, though, so I had been putting it off for his sake. A visit home was the perfect opportunity to whip up some choco-marshmallowy goodness. It also seemed like the ideal time to get together with one of my best friends, Angela. So, the day after I arrived in Ohio, Josh woke up early with me, Angela came over, and we (Ok...me) set to making a double batch of these brownies. We joked, and visited, and Angela stirred the brownie batter! We also looked at all the butter in the graham crust and realized real s'mores are most definitely healthier...and we all silently agreed to not care. Then Angela gave in to our bad influence. We all burnt our mouths. Angela shows her beautiful, perfect bite of brownie. The guy in the fuzzy hat? That's my brother. Look. At. That. Pan. of. GOOEY. YUMMY. S'MORES BROWNIE. GOOOOOODNESSS. In a 9x9 pan (or...if you're me and have to work with what your mother has, you use an 11 x 7), melt butter. Add graham cracker crumbs and mix until fully moistened and form into crust. Mix up brownie batter according to instructions. Pour over graham cracker crust. Bake for recommended amount of time. Test with a toothpick--brownies may need an additional 15-20 minutes (because of graham cracker crust). When the brownies are fully baked, place marshmallows on top. Set under broiler for a couple minutes, or in preheated oven for another 10 minutes. KEEP A CLOSE EYE-make sure the marshmallows don't burn! 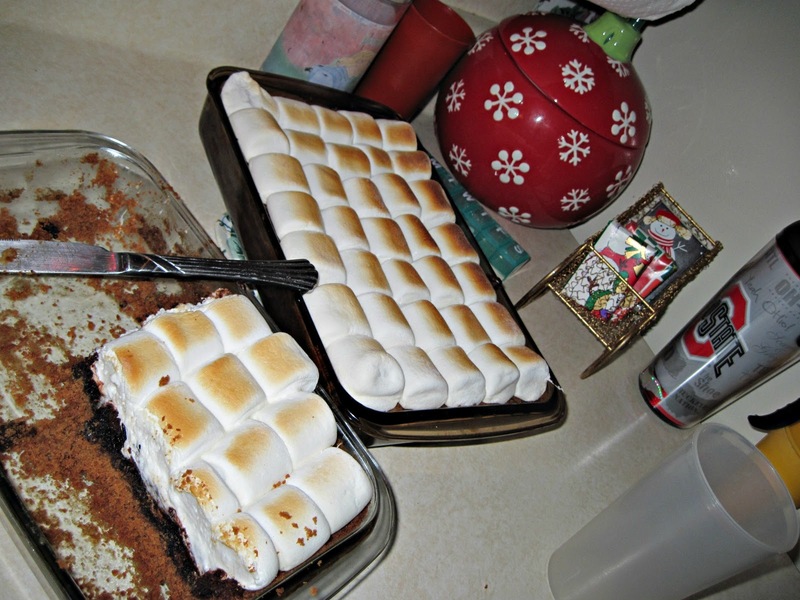 Nothing says Christmas like S'mores Brownies. Wow! These look amazing!! Such an easy way to really add a wow factor to plain old brownies! What a lovely treat to share with family! So warm and delicious! Oh man - look at those marshmallows - yum! oh boy, those sure look great!